There is out again a special edition from Winston Red / Blue called "Win Freedom Tour" - it's again a competition to win a trip to California. There is also out another special edition from Benson & Hedges Black / Silver / White as slide-edition called "Choose your Mini" - it's also a competition to win a car. Philip Morris Supreme (4 mg), Blue (6 mg) and Original (10 mg) are out in an absolutly new design. Camel Natural Flavour is out with a special emblem on the foile as "Testsieger". 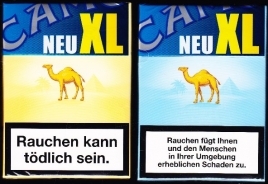 Camel has released the style Filter and Blue as brandnew 23's packs in Austria. Barcode of 23's Filter is 9008100 101635 and barcode of 23's Blue is 9008100 101642. Batton started to change the design of all of their packs now. Matrix Menthol is now sold by DanCzek AT in Austria too. Barcode is 5998900 509608, tar is 7 mg and nicotine is 0,6 mg.
Mohawk is out in Austria now as Mohawk Red 25's, Mohawk Red 100, Mohawk Blue 25's and Mohawk Blue 100. Another 10 new Camel Blue Colour Edition is out now. With Pepe Fine Green is the 3rd different "Green" pack available in Austria - it is made by Johann WIlhelm von Eicken in Germany and imported by Moosmayr. The bar-code is 4006396 003508 and they have 3 mg tar and 0,3 mg nicotine. Benson & Hedges changed their design of the H&S packs of Black, Silver and White a little bit - the packs have no plain paper anymore, they have small points on the paper.